Broiler chicken has become costlier by up to 50 per cent in March due to rising festive demand and lower production following large-scale bird deaths caused by widening day-night temperature differences. Trade sources say that broiler chicken in Delhi is selling today at Rs 94 a kg as compared to Rs 62 a kg early this month, recording a 50 per cent rise in three weeks. The commodity reported a price rise of 35 per cent in Hyderabad to Rs 105 a kg on Wednesday from Rs 78 a kg in the beginning of March. 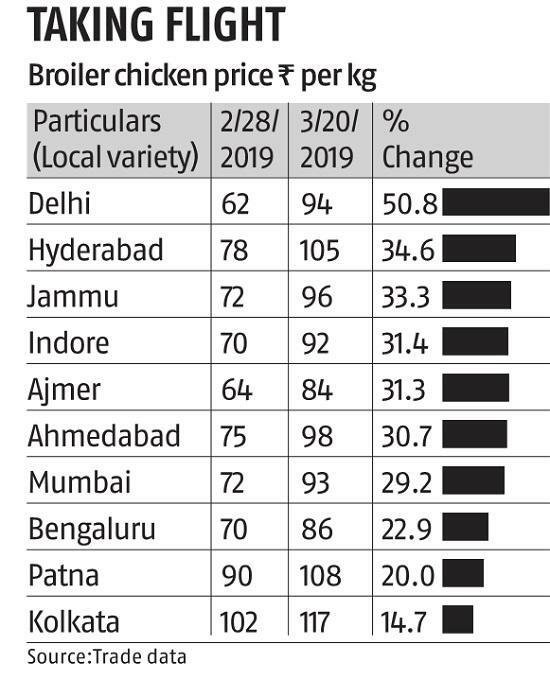 Broiler chicken prices jumped in all other centres as well across the country. The sudden surge in prices has come as a major relief for poultry farmers who suffered heavily due to long spells of suppressed sentiment. Immediately before the current rise, broiler chicken prices remained below the cost of production, which large corporate like Venky’s anticipate at Rs 75 a kg. Sustained rise in feed prices coupled with lower production is set to keep broiler chicken prices firm during the remaining period of this season ending June 2019. “Price of broiler chicken has risen rapidly due to a sharp increase in feed prices and lower production. Birds require stable temperature during day and night for survival. In March this year, however, there has been a very wide difference in temperature between day and night which resulted into killing of birds. 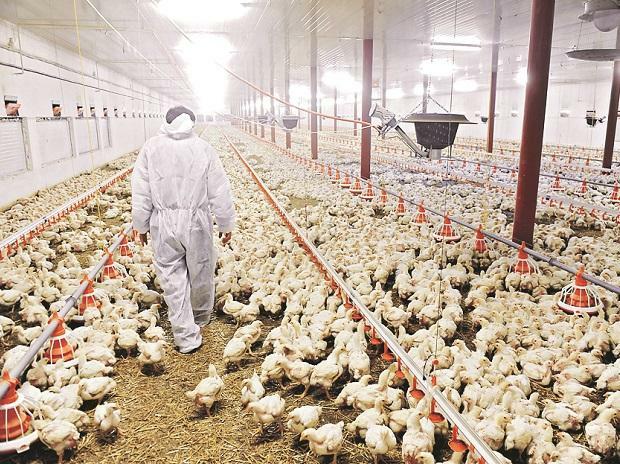 Consequently, production has been lower than the demand which supported the current price rise or broiler chicken,” said Balram Yadav, Managing Director, Godrej Agrovet Ltd. Normally, broiler chicken demand rises immediately after the end of examination season and continues till the next holy month of Shravan. As the season progresses and demand continues, broiler chicken prices are expected to remain firm. “We see ex-farm broiler chicken price to touch Rs 100 a kg in Mumbai from the current level of Rs 84 a kg in the next few weeks,” said Yadav. Feed is another ingredient which helped price spurt of broiler chicken. Maize for example, has become costlier this year by 50 per cent to trade at Rs 21-22 a kg as compared to Rs 14-15 a kg around the same time last year. Apart from that, soymeal prices have also jumped in tandem. “Just because of a sharp increase in maize prices, our cost of production has gone up by Rs 4 a kg this year. We do not see any room for price to fall from this level. In fact, broiler chicken price will remain firm at above the cost of production threshold of Rs 75 a kg till the next festive season begins after June 2019,” said K G Anand, General Manager, Venky’s Group. In contrast, however, eggs prices have started softening in March after rising by a staggering 16 per cent in February. After having entered in to deflation zone in August ’18, egg prices have reported an increase of 23 per cent in February. In Pune, for example, eggs prices have declined by 23 per cent to Rs 3.55 a piece on Wednesday as compared to Rs 4.60 a piece early March, data compiled by the National Egg Co-ordination Committee (NECC) said.